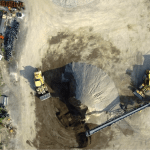 Taking Mining to the Future with Mining Surveys by Aerial Drones | Canadian UAV Solutions Inc. 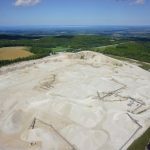 Taking Mining to the Future with Mining Surveys by Aerial Drones | Canadian UAV Solutions Inc.
Mining is hard and difficult work. While it was once a business that relied on a lot of hunches on where to find certain materials, now mining is more precise, carefully done, and scientifically backed. Unlike the treasure hunt that it once was, mining has morphed into a business that knows where it’s going. However, that doesn’t mean there isn’t room for improvement! With mining surveys done by unmanned aerial vehicles (UAVs), your mine can have better, more accurate information right at your fingertips. When traditional survey methods are used on a mine site, there are several disadvantages. Not only does a surveyor need to walk around certain risky areas (or be denied access completely due to safety reasons), but their surveying ability is also based largely on the environment. Getting your mine base elevation can be difficult when shooting within a 50m-deep hole, and often the survey information might be inaccurate or skewed somewhat. With mining surveying done by UAV, there’s no such thing as a risk to a person because the person is safely operating the drone from a distance. With mining surveys from aerial drones, you get so much more information than just what the lay of the land looks like. You can get accurate measurements of your materials, fill amounts, depths of dug areas, a detailed orthographic mosaic, and so much more. This information can all be gathered quickly, and without the need to adjust for human error. We would love to help you with your mining survey needs. Contact us at Canadian UAV Solutions Inc. today for more information.